This is the area for Fully Automated Disintegration Testing products. Below you find an overview of our products. Please move forward to get all information about performance, accessoires, calibration tools and consumables. Our range of tablet and capsule automated disintegration testers meet in detail the current specifications of the most recent USP <701/2040> and EP <2.9.1/2.9.1.2> monograph. As with all of our products all instruments are manufactured with a stainless steel housing which is designed to be more GMP compliant than painted housing designs. A lot of these instruments find their place in QC and IPC laboratories and as most of the other equipment in these areas is finished in stainless, the Pharma Test equipment certainly does not look out of place. 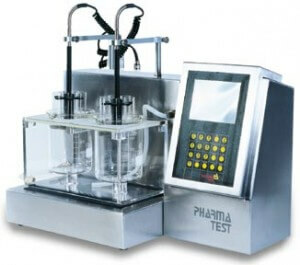 The PTZ AUTOEZ instruments are the fully Automated Disintegration Tablet Test Systems. The single as well as the multiple station analyser will allow independent operation of either basket for the fully automated determination of the exact disintegration time of all tablets in the baskets. The analyser already has built in electric lifts so medium change for extended disintegration times is made easy. Using the PT-MKT and PT-MKT33 electronic baskets the option now is to choose if you need to work accoring to USP or EP monograph or use the bigger tube baskes according to USP and EP . Both versions offer the online temperature measurement of the disintegration buffer. This is the fully automatic version of the PTZ AUTO series. With upgraded electronics and the PT-MKT or PT-MKT33 baskets. The dual station Tablet and Capsule automated Disintegration Test Instrument will allow the fully automated determination of the exact disintegration time of all tablets in the baskets. The PTZ AUTOEZ has a built in electric lift, so medium change for extended disintegration times is made easy. All of the PTZ AUTOEZ Fully Automated Tablet Disintegration Test Instruments meet the specifications of USP <701/2040> and EP <2.9.1/2.9.1.2> monographs in full. Depending which size of sample needs to be tested select either the PT-MKT or PT-MKT33 electronical baskets which are both equipped with a temperature sensor to monitor the disintegration buffer temperature, regardless of how many vessels there are in operation. The operational concept of the electronic basket types PT-MKT and PT-MKT33 are simple in design and operate through electrical contacts in each of the 6 (3) working positions of each basket. This is an easy to maintain device and offers the user the additional security that any of the electronic discs may be used in any of the disintegration tubes. There are no overly complicated detectors which need to be “tuned” to each particular tube or disk. Rigid tiny metal rings are used to make the contact of the disks with the sieve segments. Connect a common PCL printer to the parallel printer port of the PTZAUTOEZ and at the end of a run, when all tablets are disintegrated, a full test report is printed including individual disintegration, maximum and minimum time. The standard instrument allows to edit maximum 16 testing methods which can be selected by authorised users to start a test. Now all that you need for a complete data management and documentation is the PTZ32 software package (21CFR part11 compliant). The PTZ32 software from Pharma Test provides effective data and hardware management for tablet disintegration studies and Quality Control. It also includes a batch comparison statistics program, temperature recording and password protection. PTZ AUTOEZ Systems are also available as PTZ AUTO series (semi-automated). These series are upgradable to PTZ AUTO EZ.